Congratulations to the EHS varsity football team on their 56-14 victory over Maypearl on Friday! Also, I would like to say a special thank you to all the parents and friends that made the long trip over to Maypearl to support our football team, cheerleaders, and band. The Middle School is having a book fair throughout this week. Must Have App for Teachers! Ever at the end of your rope in dealing with student behavior? Do you need new “tools” for your toolbox when dealing with disruptive classroom conduct? Now there’s an app for that!! 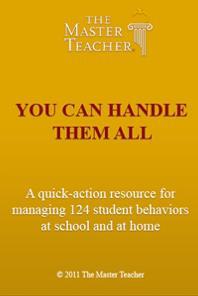 “You Can Handle Them All” is a FREE app from iTunes full of suggestions for managing those little behavioral issues that creep into the classroom to steal your instructional time. Just select the student behavior from the list, and this app not only offers strategies for impacting that student behavior, it also proffers possible reasons for that student’s conduct. Now I can’t promise that you will agree with the solutions offered by “You Can Handle Them All”, but since its free, it is certainly worth a try! So, the next time a student challenges your authority or your sanity, “take 10”, breathe, whip out your phone, and open “You Can Handle Them All”. If nothing else, it will give you time to “cool off”! Thanks to Molly for sharing this great app! It is now on our school’s iPads in case you want to check it out! Author Twyla FeltyPosted on October 29, 2011 Categories GeneralLeave a comment on Must Have App for Teachers! The JASON Project connects students with scientists and researchers in real- and near-real time, virtually and physically, to provide mentored, authentic and enriching science learning experiences. The JASON Project is a website that is dedicated to connecting “…students with scientists and researchers in real- and near-real time, virtually and physically, to provide mentored, authentic and enriching science learning experiences.”The JASON Project’s curriculum is aligned to the national and state standards and is broken into five major projects: forces and motion, geology, energy, ecology, weather, mysteries of Earth and Mars, and the disappearing wetlands. To access this great material, you do need to register—but that process is both free and easy! Once you have set up an account, you can create classes, assessments and access all materials in the seven major units. Our 8th grade Science teacher uses Jason.org in her classroom and was the one who suggested that I check out this great resource. It seems impossible, but this is the last Friday in October! There are also several events happening today and tomorrow. First, the varsity football team travels to Maypearl tonight. Kickoff is set for 7:30. The High School cheerleaders and the Mighty Bulldog Marching Band will be supporting the Bulldogs and entertaining the crowd. The PTO Pumpkin Patch will take place this evening at the Primary and Intermediate campuses. Tomorrow, the Lady Bulldogs will be playing Cross Roads in a warm-up volleyball game. The game will start at 10:00 AM and will be played in the E. L. Kirk gym. If you want to see more volleyball on Saturday, EISD will also be hosting a playoff game. Wills Point will be playing Lindale at 2:00 PM. Also, a reminder that our Lady Bulldogs will be competing for the bi-district volleyball championship on Tuesday in Corsicana. The Lady Bulldogs will be facing Red Oak Life. The game is set to start at 8:00 and will be played at Corsicana High School. Look for the November issue of the Update to come out later today. I hope everyone has a great weekend! Yesterday, the TIS team trained staff members on “The Three Tiers of Technology Integration” in order to pass along information we had received during the TCEA “Texas Steps Up” Training with Monica Martinez. Moving toward technology innovation in the classroom can be a daunting task as teachers juggle curriculum, discipline and state-based assessments that often seem to conflict with the 21st century skills that we now need to cultivate in our students. Teachers need dynamic resources and support in order to become facilitators for this process. One of the best “one-stop-shopping” posts has been put together on 21st Century Educational Technology and Learning by Michael Gorman. 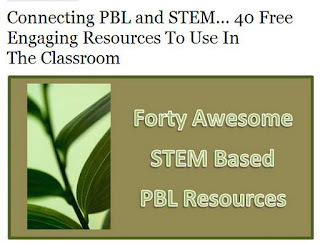 In his post on 21st Century Ed Tech and Learning, Gorman has compiled a comprehensive list of resources for teachers to use in classroom for PBL and STEM. He also includes a short list of free software that supports STEM-based PBL. It can seem at a glance that the resources found in this post are dedicated to the upper-level grades, but please do look further! I am a novice blogger, and my very first post this year was about BIE, The Buck Institite for Education. This site has rubrics for the primary grades as well as a comprehensive library of activities from which teachers can pull or use as a launching point for ideas. This library can be searched by subject and level and may be a great place to start, so…..let’s get started! And let me know how I can help! First, as is evident, we are not currently earning what we budgeted. We have made up for this difference by budget amendments; however, because our enrollment has dropped since the end of the 1st six weeks, we will probably continue to earn less than was budgeted. We have already done additional budget amendments in an attempt to compensate for these differences. Second, it needs to be remembered that we are only receiving a portion of the funding that we are earning because of the cuts in funding to all public schools. Although our High School ADA differs considerably from what we anticipated, it is not affecting our High School Allotment dramatically (a difference of about $5,600). The mainstream ADA is down from last year and that does make a significant difference in what were were projecting in special education funding. Recall that the line labeled “Less Local” is dependent on our property values. To determine this figure, the state takes our property value, divides it by 100 and multiplies it by $0.86. So, as our property values rise, our state funding decreases. You can see on the line for Technology, that we are not receiving any state aid. The technology allotment has been rolled into the new Instructional Materials Allotment. As we progress through this school year, I will continue to provide updates on our financial situation. If you have any questions, please do not hesitate to contact me at cholcombe@eustaceisd.net or just come by the administration building. Congratulations to the varsity volleyball team on their victory against Buffalo last night! With the win, the Lady Bulldogs have secured second place in district and will be headed to the bi-district round in the state playoffs. The bi-district game is set for Tuesday, November 1 in Corsicana. The game will start at 8:00 PM. The Lady Bulldogs will be hosting Cross Roads this Saturday in a warm-up game. The game is set to start at 10:00 AM. 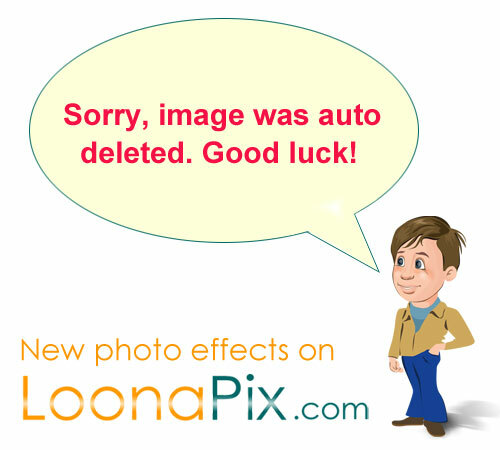 We love to communicate through images, and one fun website to use is LoonaPix! LoonaPix allows you to upload a photo, add a photo effect and share, embed or e-mail the image you create. I would love to have more time to get into LoonaPix and play, but, it was so simple to use, that I was able to open the site, upload my photo, and make several images to send out to my Dad in honor of his 87th birthday. Below is one of the images that I created on LoonaPix for this special occasion. Happy Birthday Gramps! I love you!! Gramps, you are worth a million! JV Girls – Perfect score – Eustace finished 1, 2, 3, 4, & 5. JV Boys – Eustace finished 1, 2, 3, 4, & 6. Varsity Girls – Perfect Score – Eustace finished 1, 2, 3, 4, 5. Varsity Boys – Eustace finished 1, 2, & 3. The varsity girls and varsity boys teams will both be advancing to the regional cross country meet. The regional meet will be in Arlington on November 5. In the middle school division, the EMS girls finished first and the EMS boys finished second. A reminder that our high school volleyball teams will be in action tonight against Buffalo. The games start at 5:00.